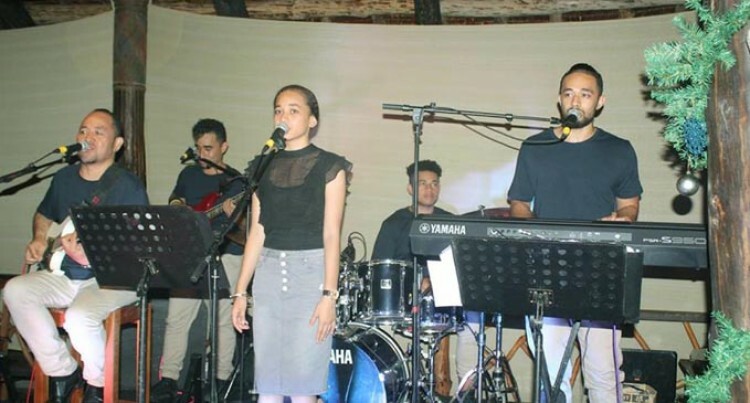 The bands gig at Leleuvia Island Resort. Meet the Taukafa family a singing sensation family band that now go by the name “Soundwave of the Pacific. Established in November 2011, Garam Masala talked with the band’s father, lead guitarist and vocalist, Leonaitasi Taukafa about his family’s music journey. Taukafa explains the band was known as the Tongan Young Five consisting of 5 of his children. He’s an accountant by profession and has been working at the University of the South Pacific for the past 10 years before taking up his current job with the Pacific Islands Forum Secretariat in Suva. The group toured Tonga in June 2012 and decided to give the honour of re-naming the group, to the president of the Free Church of Tonga, Reverend Semisi Fonua, and he then re-named the group as the “Soundwave Of The Pacific” Or “Peauongo ‘Oe Pasifiki” in Tongan. He said “Soundwave of the Pacific” simply encompass the idea of music, Pacific sounds and melody travelling through the waves of the vast ocean of the Pacific. Taukafa said they’ve an excellent repertoire that pleases any age group and are the talk of Suva’s tight-knit music fraternity. They produce their own original songs, but mainly Gospel songs and a non-Gospel song titled “Tonga My Love my Home”. Taukafa is a musician himself and it all started off when he bought a keyboard for his eldest son Captain in early 2011 when he was 14 years old. “Our second son, Steven then asked for a bass guitar on his birthday in May and Samuela (drummer) asked for a drum kit later in the same year and the group was then formed. He said his kids’ talents began to show whenever they got together and play and started singing at very young age during family evening prayers and during church services. What sets them apart is the age of the kids– they are so young compared to the quality level of performance, both instrumental and vocal wise. They’ve featured with well-known local artists like Knox, SeruSerevi, LaisaVulakoro, Ken Jensen, Black Rose and Tom Mawi. Some of the challenges would be trying to balance out work, school, family, church commitments and band engagements. He said the lack of professional expertise in the field of vocal and musical instrument training and the lack of support and respects from business community towards promoting live band performance. “Increase usage of music programming for live performance and recording, this will eventually discouraged grown up musicians, in developing their skills in playing musical instruments and also their vocal ability due to programs that are now enhancing recorded vocals. We have now identified that the main asset of the group is our lead vocalist, Lydia, who just recently won a singing competition with her rendition of the Gospel version of Purple Rain by Isabel Davis called “Jesus Reigns” . Taukafa said at the same time, further develop the individual members with their own instrumental skills. The band would also like to tour Hawaii and the USA and to also take part in major concerts in NZ, Australia and Hawaii. For them social media has worked a lot in our favour. The best example was when the video of our performance of Julia Zahra’s version of “Just an Illusion” at the FBC stage during Hibiscus of 2016, went viral on social media, and amazingly Julia Zahra happen to watch it and actually commented on the video “This is just incredible. “Another video of our daughter singing Whitney Houston’s “One moment in time” also went viral and surprisingly, the Tongan member– Dinah Jane, of the well-known USA group called “Fifth Harmony” also commented on the video saying that “Lydia has an amazing voice and that she really loves her voice”. He grew up in a musical loving family where he was pushed to learn proper music starting at form 1 at high school in Tonga. He said the music subject was taught properly in the education curriculum in Tonga and you get to learn how to read and write proper music at a very young age through the education system. His parents have been his greatest supporters and so he wants to provide the same support to his kids and hence decided to form the family band. The inspiration comes from their belief that if God gives us the talents, than it is our responsibility to make good use of it to honour and glorify his name. Their advice to other upcoming bands is to follow your dreams and aim for the highest, don’t be discouraged with the challenges but treat them as opportunities. The band would like to thank their fans, families and friends in Fiji and Tonga and everywhere in the world for the support. “To our uncles, Kelepi, Kilifi, Lisiate, Niulolo, Nehumi, Kenitoni, Paula and Takapu for the instruments and gears that you have all contributed to us,” said MrTaukafa. Benjamin Taukafa, 10, plays the tambourine. Roadies– Richie Fotu, Marc MacDonalds and Paini Lie.